The Asus t100 tablet is this amazing and odd little thing: it sells for under $200, yet has a full-featured Atom 64-bit CPU, 2GB RAM, 32 or 64GB SSD, etc. By default, it ships with Windows 8.1. It has a detachable keyboard, so it can be used as a tablet or a very small 10″ laptop. I have never been a fan of Windows on it. It does the trick for web browsing and email, but I’d like to ssh into my machines sometimes, and I just can’t bring myself to type sensitive passwords into Windows. I decided to try installing Debian on it. After a lot of abortive starts due to the UEFI-only firmware, I got jessie installed. (The installer was fine; it was Debian Live that wouldn’t boot.) I got wifi and battery status working via an upgrade to the 4.1 kernel. A little $10 Edimax USB adapter was handy to spare a bunch of copying via USB disks. I have been using XFCE with XMonad for so many years that I am somewhat a stranger to other desktop environments. XMonad isn’t really suitable for a tablet, however, so I thought I’d try Gnome, especially after a fairly glowing review about its use on a tablet. I am already disappointed after just a few minutes. There is no suspend button on the menu. Some Googling showed that holding Alt while hovering over the power off button will change it to a suspend button. And indeed it does. But… uh, what? That is so common and so non-obvious. And pushing the power button does… nothing. That’s right, nothing. Apparently the way to enable some action when you push the power button is to type in a settings command in a terminal. There’s no setting in the settings panel. I initially ditched Gnome some years ago due to its penchant for removing features. I had hoped that this much time later, it would have passed that stage, but I’m already disappointed. I was hoping for some really nice integration with the system. But my XFCE setup has a very clear “When power button is pressed” setting. I have no idea why Gnome doesn’t. Also, the touch screen works fine and it registers my touches, but whenever I touch anywhere, the cursor disappears. Weird, eh? There are some things to fix yet on the tablet (sound, brightness adjustment, and making suspend reliable) but others have solved these in Ubuntu so I don’t think it’ll be too hard. In the meantime, any suggestions regarding Gnome? Is it just going to annoy me? Maybe I should try KDE also. I’ve heard good things about Plasma Active, but don’t see it in Debian though. I am really tired of things Google has done lately. The most recent example being retiring Classic Maps. That’s a problem, because the current Maps mysteriously doesn’t show most of my saved (“starred”) places. Google has known about this since at least 2013. There are posts all over their forums about it going back to when what is now “regular” Google Maps was beta. Google employees even knew about it and did nothing. For someone that made heavy use of it, this was quite annoying. Removing the XMPP capabilities in Google Talk/Hangouts. Picasaweb pretty much shut down, with very strong redirects to Google+ Photos. Which still to this day doesn’t have a handy feature for embedding in a blog post or anything that’s not, well, Google+. General creeping crapification of everything they touch. It’s almost like Microsoft in the 90s all over again. All of a sudden my starred places stop showing up in Google Maps, but show up in Google Drive — shared with the whole world. What? I never wanted them in Google Drive to start with. All the products that are all-but-dead — Google Groups and the sad state of the Deja News archives. Maybe Google+ itself goes on this list soon? Looks like they’re trying to kill off Google Voice and merge it into hangouts, but I can’t send a text from the web with Hangouts. And this massive list of discontinued services and products. Yeowch. Remember when Google Code was hot, and then they didn’t touch it at all for years? And they still haven’t fixed some really basic things, such as letting people change their email address when they get married. Dropping SIP from Grand Central, ActiveSync from Apps, etc. I even used to use Flickr, then moved to Picasa when Yahoo stopped investing in Flickr. Now I’m back to Flickr, because Google stopped investing in Picasa. The takeaway is that you can’t really rely on Google for anything. Counting on something being there for an upcoming trip and then having it be suddenly yanked away is a level of frustration that just makes the service not so useful. Never knowing when obvious things (7-day calendar view) will be removed means you just can’t depend on it. Alternative calendar applications. Ideally it would support shared calendars for multiple people in a family, an Android app that lets you easily view some or all calendars, etc. I wonder if outlook.com is really the only competitor here? Last I looked — a few years ago — none of the Open Source options really worked well. Alternative mapping applications. Must-haves include directions, navigation in the car, saving points of interest, and offline storage on Android. Nice-to-haves would include restaurant review integration, etc. Looks like Nokia (HERE.com) and Mapquest, plus a few OSM spinoffs, are the leading contenders here. Email is easily enough found elsewhere, and I’ve never used Gmail much anyhow. Anybody else moving off Google? And indeed, if I run ssh -o MACs=hmac-md5, it works fine. Now, I tried rebooting machines at multiple ends of this. No change. I tried connecting from multiple networks. No change. And then, as I was writing this blog post, all of a sudden it works normally again. Supremely weird! Any ideas what I can blame here? Yep, that’s a computer. 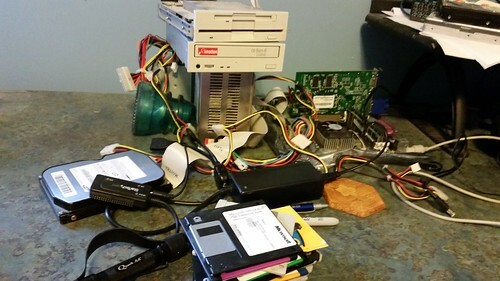 Motherboard to the right, floppy drives and CD drive stacked on top of the power supply, hard drive to the left. The point of this exercise is to read data off the floppies that I have made starting nearly 30 years ago now (wow). Many were made with DOS, some were made on a TRS-80 Color Computer II (aka CoCo 2). There are 5.25″ disks, 3.25″ disks, and all sorts of formats. Most are DOS, but the TRS-80 ones use a different physical format. Some of the data was written by Central Point Backup (from PC Tools), which squeezed more data on the disk by adding an extra sector or something, if my vague memory is working. Reading these disks requires low-level playing with controller timing, and sometimes the original software to extract the data. It doesn’t necessarily work under Linux, and certainly doesn’t work with USB floppies or under emulation. Hence this system. It’s a bridge. Old enough to run DOS, new enough to use an IDE drive. I can then hook up the IDE drive to a IDE-to-USB converter and copy the data off it onto my Linux system. But this was tricky. I started the project a few years ago, but life got in the way. Getting back to it now, with the same motherboard and drive, but I just couldn’t get it to boot. I eventually began to suspect some disk geometry settings, and with some detective work from fdisk in Linux plus some research into old BIOS disk size limitations, discovered the problem was a 2GB limit. Through some educated trial and error, I programmed the BOIS with a number of cylinders that worked, set it to LBA mode, and finally my 3-year-old DOS 6.2 installation booted. I’m never sure whether to post such things here, but I hope that it’s of interest to people: I’m trying to hire a top-notch Linux person for a 100% telecommute position. I’m particularly interested in people with experience managing 500 or more OS instances. It’s a shop with a lot of Debian, by the way. You can apply at that URL and mention you saw it in my blog if you’re interested. This evening, after the boys were in bed, Laura and I sat down to an episode of MASH (a TV series from the 70s) and leftover homemade pumpkin bars. She commented, “Sometimes I wonder what generation we’re in. This doesn’t seem to be something people our age are usually doing.” Probably true. I suppose people my age aren’t usually learning to play the penny whistle or put up antennas in trees either. We’ve had a fun day today – a different sort of day in a lot of ways. We took the boys for their first Wichita Symphony Orchestra experience — they were doing their first-ever “family concert” (Beethoven Lived Upstairs, which combined Beethoven’s music with a two-person play aimed at kids). And they had an “instrument petting zoo” beforehand. Both boys loved it. After that, we took them to a sushi place for the first time. We ordered different types of rolls for our table, encouraging them to start with the California roll. They loved it (though Oliver did complain it was a bit hard to eat). Jacob happily devoured everything he could that wasn’t spicy. He would have probably devoured the plate of California roll slices by himself if I hadn’t stopped him and encouraged him to slow down and try some other things too. It doesn’t seem very common around here to take 5-year-olds to a sushi place and plan on them eating the same sort of food that the adults around them are. It is a lot of fun to be different. Jacob and Oliver both have their unique personalities and interests, and I hope that they continue to find strength and joy in all the ways they are unique. Today, 4PM. Jacob and Oliver excitedly peer at the box in our kitchen – a really big box, taller than them. Inside is is the first model airplane I’d ever purchased. The three of us hunkered down on the kitchen floor, opened the box, unpacked the parts, examined the controller, and found the manual with cryptic assembly directions. Oliver turned some screws while Jacob checked out the levers on the controllers. Then they both left for a bit to play with their toy buses. A little while later, the three of us went outside. It was too windy to fly. I had never flied an RC plane before — only RC quadcopters (much easier to fly), and some practice time on an RC simulator. But the excitement was too much. 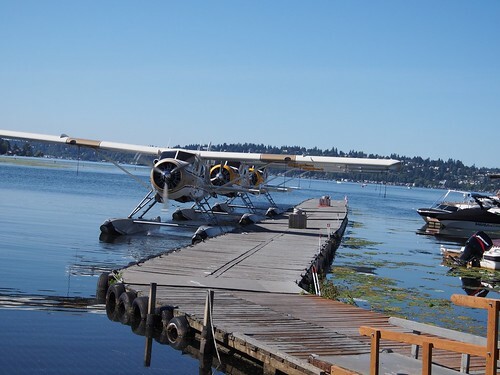 So out we went, and the plane took off perfectly, climbed, flew over the trees, and circled above our heads at my command. I even managed a good landing in the wind, despite about 5 aborted attempts due to coming in too high, wrong angle, too fast, or last-minute gusts of wind throwing everything off. I am not sure how I pulled that all off on my first flight, but somehow I did! It was thrilling! I’ve had a lot of hobbies in my life. Computers have run through many of them; I learned Pascal (a programming language) at about the same time I learned cursive handwriting and started with C at around age 10. It was all fun. I’ve been a Debian developer for some 18 years now, and have written a lot of code, and even books about code, over the years. Sometimes I find ways to merge hobbies; I’ve set up all sorts of amateur radio systems on Linux, take aerial photographs, and set up systems to stream music in my house. But I also have a lot less time for hobbies overall than I once did; other things in life, such as my children, are more important. Some of the code I once worked on actively I no longer use or maintain, and I feel guilty about that when people send bug reports that I have no interest in fixing anymore. Sometimes I feel a need to cut down, and perhaps have; and then, I get an interest in RC aircraft and find an airplane that is great for a beginner and fairly inexpensive. Perhaps it is the curse of being a curious person living in an interesting world. Do any of the rest of you have a large number of hobbies? How do you feel about that? 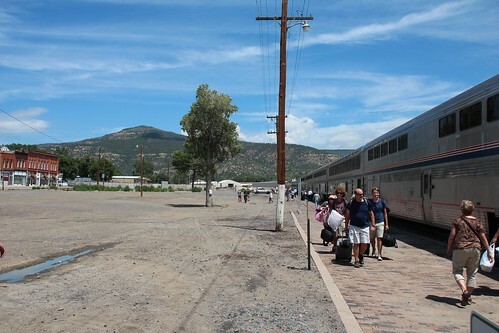 Before long, it was out the door to the train station. We even had time to stop at a donut shop along the way. 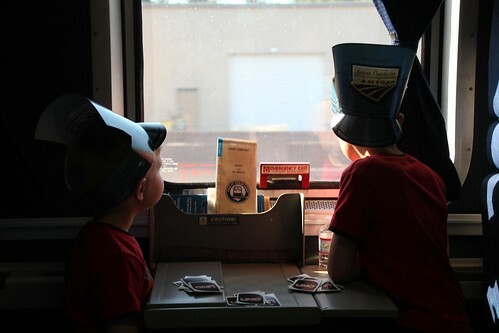 Jacob and Oliver love trains, and this was the beginning of a 3-day train trip from Newton to Seattle that would take us through Kansas, Colorado, the Rocky Mountains of New Mexico, Arizona, Los Angeles, up the California coast, through the Cascades, and on to Seattle. Whew! Through it all, we found many things to pass the time. I don’t think anybody was bored. 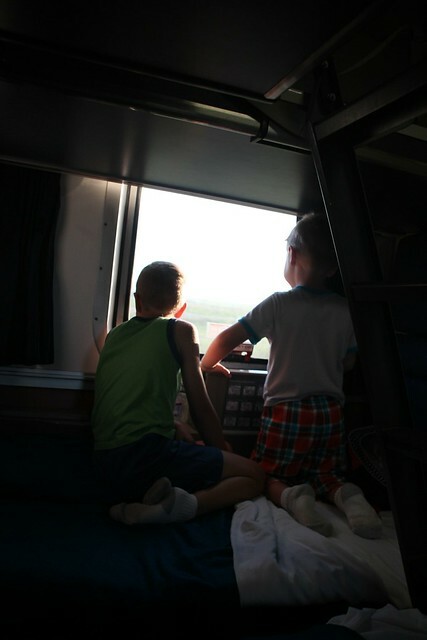 I took the boys “exploring the train” several times — we’d walk from one end to the other and see what all was there. 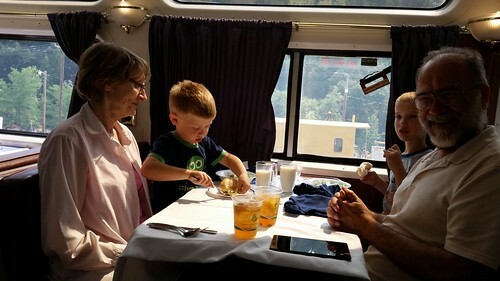 There was always the dining car for our meals, the lounge car for watching the passing scenery, and on the Coast Starlight, the Pacific Parlor Car. Here we are getting ready for breakfast one morning. 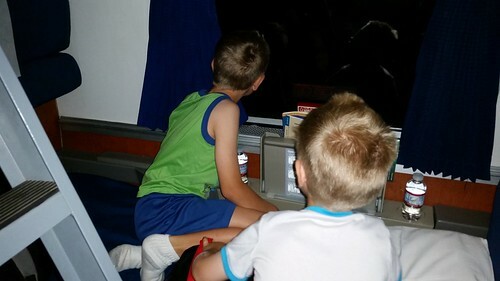 Getting to select meals and order in the “train restaurant” was a big deal for the boys. 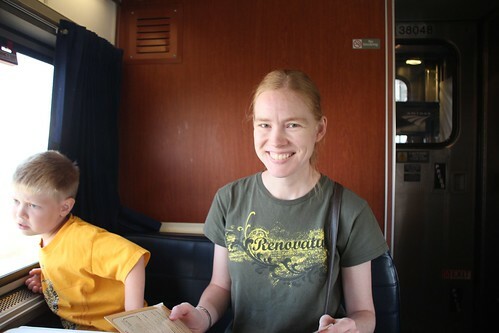 Laura brought one of her origami books, which even managed to pull the boys away from the passing scenery in the lounge car for quite some time. They had some fun wrapping themselves around my feet and challenging me to move. And were delighted when I could move even though they were trying to weight me down! 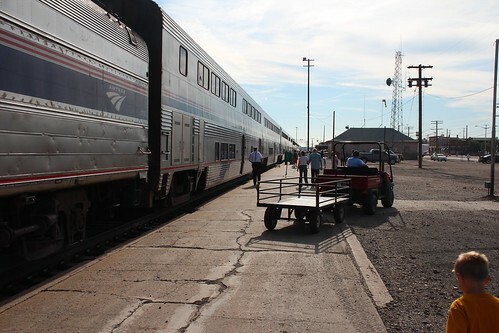 The Coast Starlight features the Pacific Parlor Car, which was built over 50 years ago for the Santa Fe Hi-Level trains. They’ve been updated; the upper level is a lounge and small restaurant, and the lower level has been turned into a small theater. 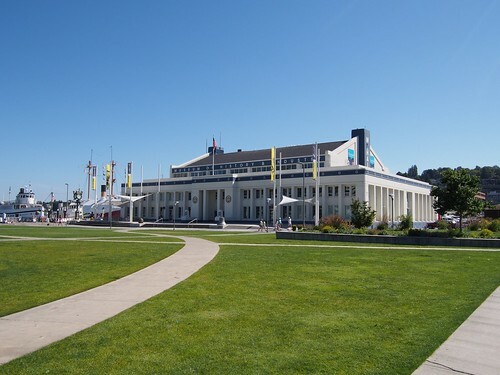 They show movies in there twice a day, but most of the time, the place is empty. A great place to go with little boys to run around and play games. The boys and I sort of invented a new game: roadrunner and coyote, loosely based on the old Looney Tunes cartoons. Jacob and Oliver would be roadrunners, running around and yelling “MEEP MEEP!” Meanwhile, I was the coyote, who would try to catch them — even briefly succeeding sometimes — but ultimately fail in some hilarious way. It burned a lot of energy. 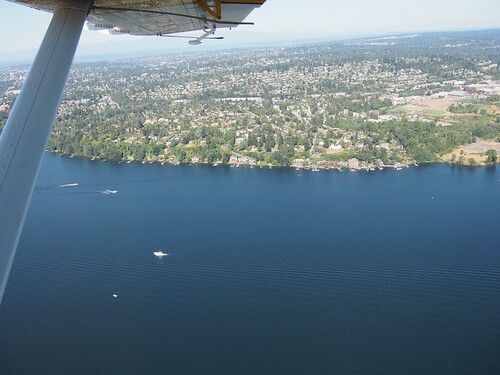 We were right along the Pacific Ocean for several hours – sometimes there would be a highway or a town between us and the beach, but usually there was nothing at all between us and the coast. It was beautiful to watch the jagged coastline go by, to gaze out onto the ocean, watching the birds — apparently so beautiful that I didn’t even think to take some photos. 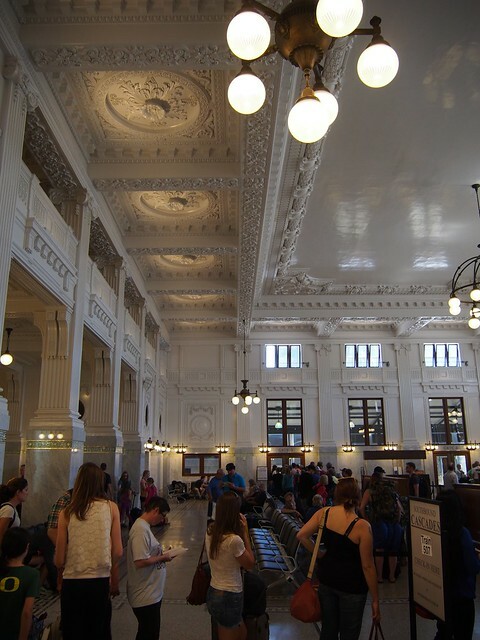 We stepped off the train in Seattle into beautiful King Street Station. 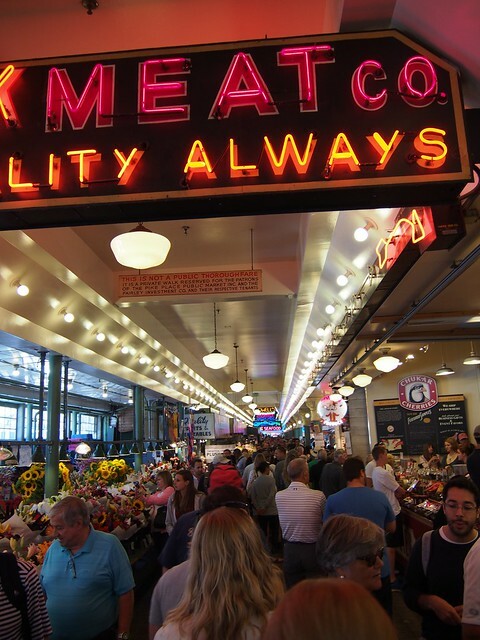 Our first day in Seattle was a quiet day of not too much. 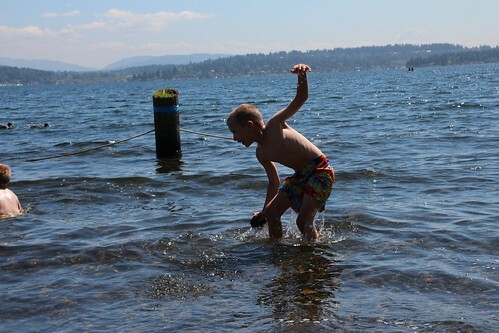 Laura’s relatives live near Lake Washington, so we went out there to play. The boys enjoyed gathering black rocks along the shore. We went blackberry picking after that – filled up buckets for a cobbler. 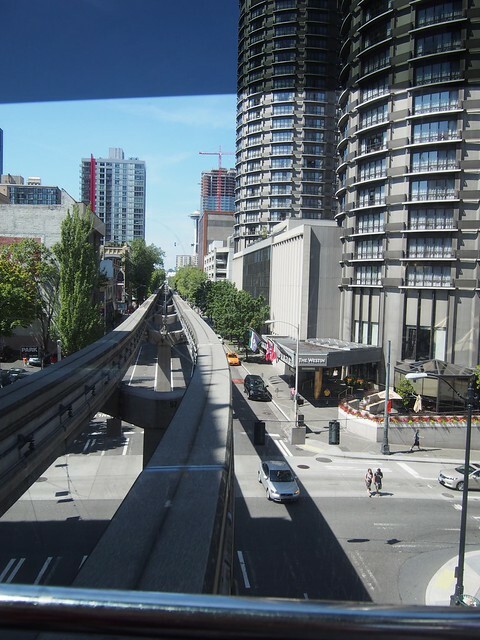 The next day, we rode the Seattle Monorail. 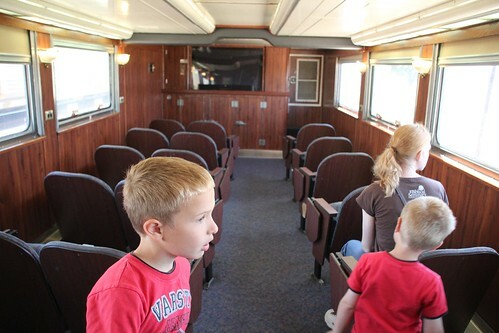 The boys have been talking about this for months — a kind of train they’ve never been on. That was the biggest thing in their minds that they were waiting for. 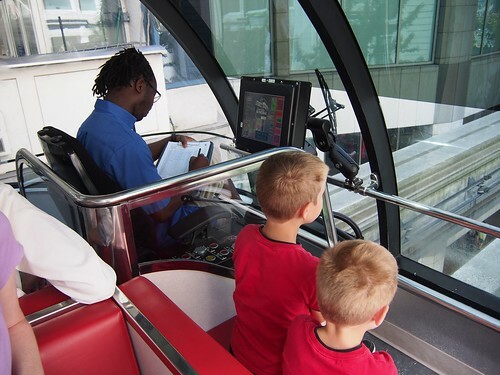 They got to ride in the very front, by the operator. Nice view from up there. 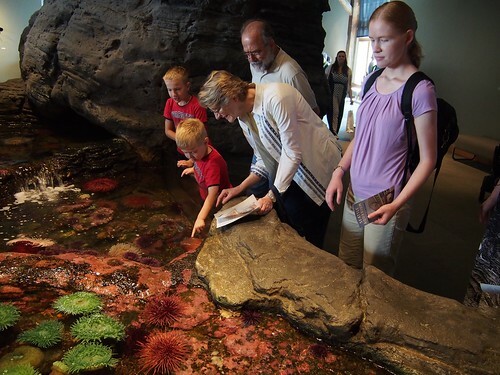 At the Seattle Aquarium, we all had a great time checking out all the exhibits. The “please touch” one was a particular hit. Walking underneath the salmon tank was fun too. 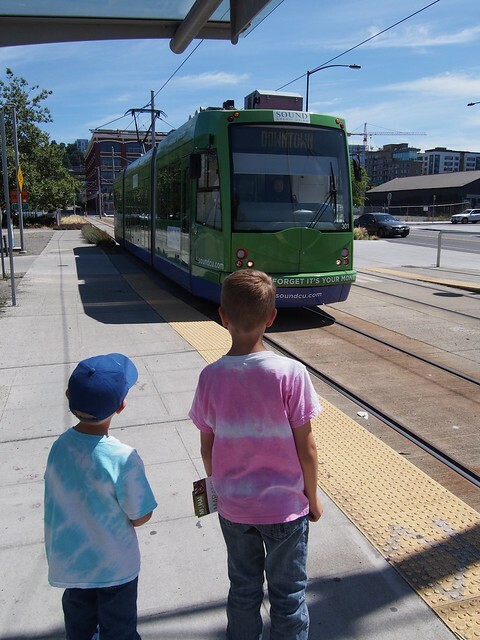 They love any kind of transportation, so of course we had to get a ride on the Seattle Streetcar that comes by MOHAI. 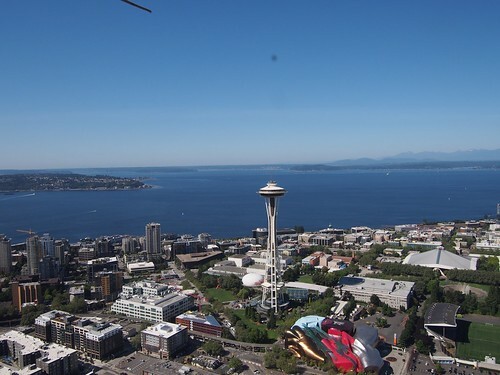 I think we got a better view than the Space Needle, and it probably cost about the same anyhow. 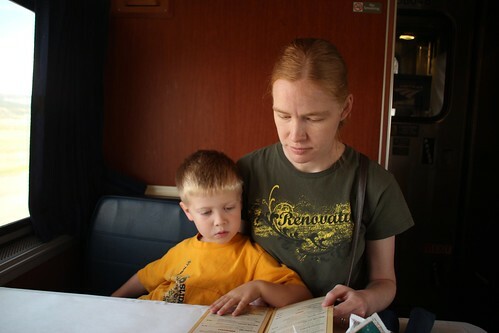 After splashdown, we took the streetcar to a place where we could eat lunch right by the monorail tracks. Then we rode the monorail again. Then we caught a train (it went underground a bit so it was a “subway” to them!) and rode it a few blocks. There is even scenery underground, it seems. 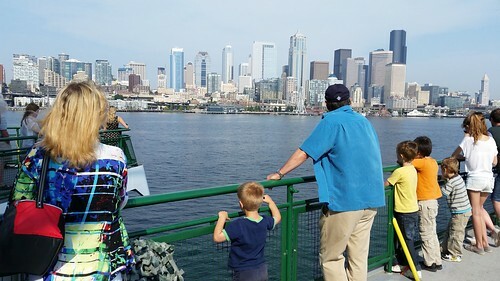 We rode a bus back, and saved one last adventure for the next day: a ferry to Bainbridge Island. Laura and I even got some time to ourselves to go have lunch at an amazing Greek restaurant to celebrate a year since we got engaged. It’s amazing to think that, by now, it’s only a few months until our wedding anniversary too! There are many special memories of the weekend I could mention — visiting with Laura’s family, watching the boys play with her uncle’s pipe organ (it’s in his house! 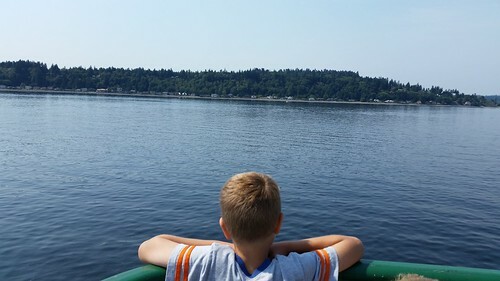 ), watching the boys play with their grandparents, having all six of us on the train for a day, flying paper airplanes off the balcony, enjoying the cool breeze on the ferry and the beautiful mountains behind the lake. One of my favorites is waking up to high-pitched “Meow? Meow meow meow! Wake up, brother!” sorts of sounds. There was so much cat-play on the trip, and it was cute to hear. I have the feeling we won’t hear things like that much more. 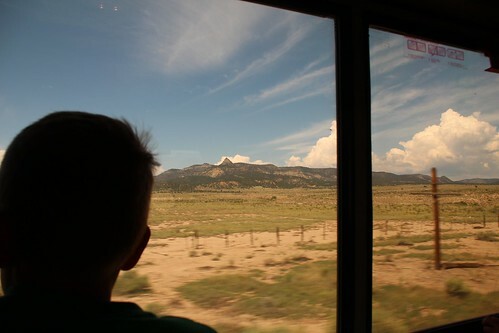 So many times on the trip I heard, “Oh dad, I am so excited!” I never get tired of hearing that. And, of course, I was excited, too. Then he was gone, and the mountain and the island stood alone. Waiting. And it came to pass in those days, as it had come before and would come again, that the Dark lay heavy on the land and weighed down the hearts of men, and the green things failed, and hope died. And men cried out to the Creator, saying, O Light of the Heavens, Light of the World, let the Promised One be born of the mountain, according to the prophecies, as he was in ages past and will be in ages to come. Let the Prince of the Morning sing to the land that green things will grow and the valleys give forth lambs. Let the arm of the Lord of the Dawn shelter us from the Dark, and the great sword of justice defend us. Let the Dragon ride again on the winds of time. The Cycle of the Dragon. The Wheel of Time turns, and Ages come and pass, leaving memories that become legend. Legend fades to myth, and even myth is long forgotten when the Age that gave it birth comes again. In one Age, called the Third Age by some, an Age yet to come, an Age long past, a wind rose in the Mountains of Mist. The wind was not the beginning. There are neither beginnings nor endings to the turning of the Wheel of Time. But it was a beginning. Born below the ever cloud-capped peaks that gave the mountains their name, the wind blew east, out across the Sand Hills, once the shore of a great ocean, before the Breaking of the World. Down it flailed into the Two Rivers, into the tangled forest called the Westwood, and beat at two men walking with a cart and horse down the rock-strewn track called the Quarry Road. And yesterday, 11,000 pages later, I have completed the series. Really, how could I have put down a book with such a majestic beginning as that? It hinted at the epic that was to come, the amazing literature I was going to read. I didn’t read it straight through; I enjoyed books like War and Peace along the way. But what a trip the Wheel of Time series was. The characters were so detailed, so deep, the setting so elaborate, the plots so grand and also so small — everyone from servants to queens were well-represented in the books. Not every section was a page-turner; in fact, around the 4th or 5th book, the series started to plod for a thousand pages or two, reading more like a history book than a novel. Sometimes the prejudices and stereotypes of the characters, particularly the sexism that both the men and women displayed, were frustrating to read. I never quite figured out of this was brilliant writing (making the reader feel frustrated at the plodding pace of the book when it was describing characters being frustrated at the plodding pace of events), or if it could have been trimmed down by 2/3 in some places. But really, the number of brilliant endings, laugh-out-loud situations, and page-turning suspense that somehow managed to build over hundreds, and then even thousands of pages, outweighed the flaws. Politics is a foggy mire full of snakes. One of the marks of truly good writing is that I leave a book or series with a sense of sadness or nostalgia, leaving characters that seem almost like friends. I felt that after finishing the last book in the series, A Memory of Light. The ending was deep, and satisfying, but ultimately left me wanting even more — even more than 11,000 pages, somehow. Jordan touched on quite a few themes of religion and philosophy. In that quote above, he has the Aiel referring to death as waking from a dream. An intriguing metaphor, isn’t it? He even writes conflicts of philosophy, religion, and culture into the series. I was particularly impressed with his treatment of theodicy and the problem of evil (the argument and religious response relating to the presence of evil in the world in the face of a loving God.) It is the most impressive treatment I have seen in fiction, and does a better job of advancing the theodistic argument than many philosophers have, I suspect. It is hard to really go into that one here because of the length and potential for spoilers. Why? Rand thought with wonder. Because each time we live, we get to love again. It felt relaxing to stare out at that distant light, so welcoming and noble. “Storms will soon come,” it seemed to say. “But for now, I am here.” I am here. I unfortunately can’t put in in its proper context due to spoilers, but it is a pivotal turning point in the series, relating to the preservation of the world. By giving what we might normally call a characteristic or behavior — evil — an almost-human voice and character, it can be discussed in interesting ways. These quotes are examples of characters in the series dealing with difficult situations. In one, a character is yelled at for offering to use her special powers to numb the pain of another person over a death. It brings up a question that those of us that have known pain might find interesting: would we really have wanted our pain erased? And suggests perhaps not. That there is a benefit to it. That we get through it by embracing it — by embracing it while still being true to our heart. He had four rules concerning action and information. Never make a plan without knowing as much as you can of the enemy. Never be afraid to change your plans when you receive new information. Never believe you know everything. And never wait to know everything. Sometimes the series treats us to logical thinkers, whether they are generals or innkeepers, and gives us little tidbits like this one. Androl brushed off his hands, smiling. Children were so adaptable. Before them, centuries of tradition, terror and superstition could melt away like butter left too long in the sun. And sometimes, things to chew over. Isn’t that an interesting comment on prejudice? Children aren’t born prejudiced; we can see how easily they make friends with anyone. It is sad that we teach them to be, isn’t it? Wheel of Time is a fine story, expertly woven. But it is not just a story. It is true, in the sense that it illuminates truths, just like Romeo and Juliet can. In it, I see lessons and echoes of the civil rights era, comments on what makes good leaders, characters wrestling with decisions without adequate data, people putting on a mask of emotions, sacrifice, and the overall theme of the entire series: the power of love and compassion. At this point, I had a decision to make. Jacob’s voice was sounding a little vexed over the radio he was using to talk to me from the next room. Do I answer it, even though he had told me I was a different train number? I decided yes. Well. I guess now I know. Jacob has been having a lot of fun with radios lately. 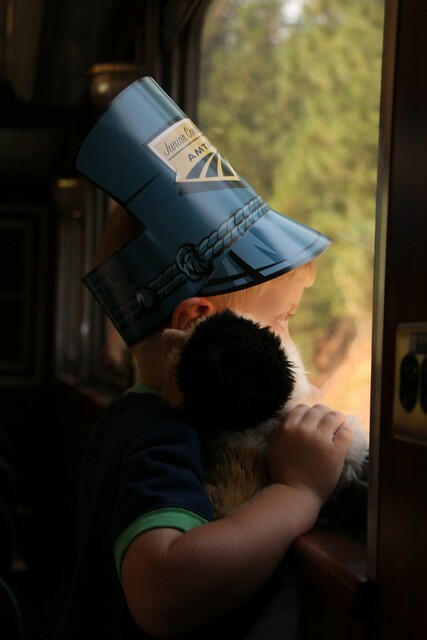 His favorite game is to pretend to be a train dispatcher. He’ll tell me, Laura, or Oliver where to go, what track to take, what passengers to pick up, or anything else he can come up with. Sometimes one radio isn’t enough — he may even have two radios clipped to him in various places. We play radio hide and seek (where you use radios to give hints or tell people when you’re ready to be found). We play train office. We use radios to communicate across the room sometimes, even. Pretty amazing to see him doing that. He’s taken an interest in my amateur radios, too. He’s been practicing — under close supervision, of course — how to use them, and how to properly give his callsign on the air. The boy is a natural. It’s fun to watch him dive into something like that and enjoy it so much!